After several months of strong year-over-year growth, sales and new contracts in the Baltimore Metro Region have slowed, and are essentially unchanged from a year ago. While this could indicate softening demand, it is still too early to distinguish a pattern. At a more granular level, single-family homes brought down the growth rate for the market as a whole because they make up more than half of the region’s sales and new contract in any given month. Sales and new contracts on single-family homes dropped from this time last year, while condos and townhomes experienced growth or remained steady. Would-be home buyers didn’t find much to choose from in January. Only 6,049 homes were available in the DC area on January 31, compared to 10,095 one year prior. Baltimore-area inventory was down to 9,386 from 12,191 last January. January’s inventory was the smallest the region has seen since 2005. Back then, before the housing market became troubled, there was even less inventory. Eager buyers snatched up homes as they came on the market. The inventory couldn’t grow. Oh how quickly things can change. You can see in the chart below that the inventory of unsold homes in the DC area tripled from January 2005 to January 2006. It nearly doubled in the Baltimore area. Inventory continued to rise until 2008 because listings were increasing while sales were falling. Only 4,000 homes were listed in the DC area in January. That is the best news sellers could ask for. As a result, we should see more competition among buyers this year. That is welcome, because buyer competition is the thing that pushes prices upward. DC area listings fell 4 percent compared to January 2012—which doesn’t sound like a big deal. But compared to January 2008, listings were down 62 percent. The huge number of listings we saw several years ago is what caused the market to slow and pushed prices down. Every year since, we have been encouraged by the steady decrease in home listings and increasing sales activity. The supply of active listings in the Baltimore Metro Area housing market continues to shrink, and is at the lowest January-level in eight years. However, the pattern appears to be changing slowly with new listings, which had the highest year-over-year gain since Spring 2011. New listings are also up across all property segments, which has not occurred in over 2 years. Even with the shifting pattern in new listings, the overall inventory still remains low. There are a wide range of factors that could be keeping sellers from listing their properties. Many could not have enough equity at current prices to “trade up” into a larger unit. Others may have trouble finding a unit to begin with because the inventory is so low. Economic uncertainty also remains a key issue on the table for many. 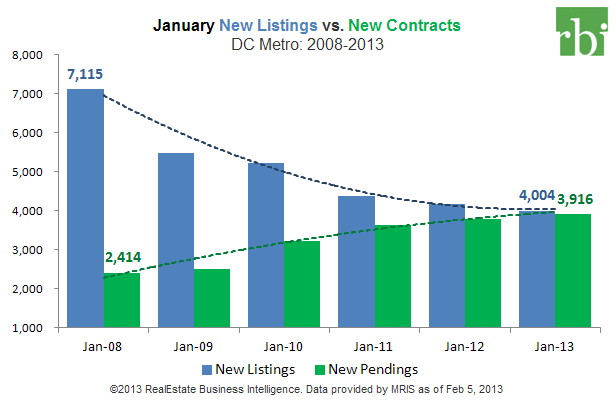 The inventory shortage continues in the Washington DC Metro Area housing market as we begin 2013. Active listings for all property segments remain low, and townhomes have the lowest proportion of listings on record. The short supply is having an impact on median sales prices, which experienced double-digit growth for the 4th consecutive month. Townhomes led in median price growth, up 13.3 percent, a $40,000 gain in value.